Reviewers from Australia examined three strategies to enhance patient flow through A&E. They searched four bibliographic databases for studies published between 1980 and 2014. Twenty-one studies were included. Advanced practice nursing roles, doctor-assisted triage and medical assessment units were found to improve A&E throughput and decrease A&E length of stay and ‘did not wait’ rates. Four out of five people are happy with their GP surgery’s opening hours, and Sunday appointments are not in demand, suggests research in the British Journal of General Practice. The information has been compiled on NHS trusts and foundation trusts (FTs) that provide secondary care services including A&E and major surgical procedures. These trusts include teaching hospitals, smaller district and general hospitals and specialist hospitals. In compiling this factsheet we are conscious that many acutes are increasingly providing a broader range of services outside of hospitals. The main focus here is on their role in delivering acute care. The data has been collected from a variety of sources and covers hospital activity, A&E, finances, workforce, social care, patient and staff satisfaction and new models of care. via Key facts and trends in acute care – NHS Confederation. 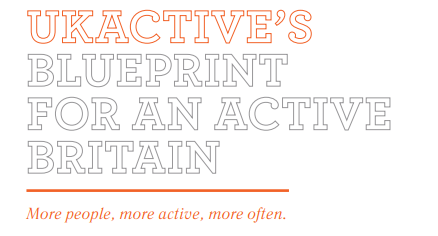 ActiveUK has published Blueprint for an Active Britain, a report which sets out clear and achievable recommendations to get the nation moving. The blueprint lays the foundations for a stakeholder-supported government-led review of how and where physical activity can play a part in improving the nation’s well-being. It sets out ten fundamental truths as the starting point of a government focus on the issues which will lead to greater cohesion between stakeholders, government and the physical activity sector in re-embedding activity back into the public’s daily lives. The report does not dwell on or analyse structural changes within the NHS or the political battles and tussles that have taken place during the year. Instead it focuses just on the latest available statistics, revealing what is happening on the frontline of care. How many babies are being born? How many midwives are there to help these babies safely into the world? Are we training enough new midwives to deal with the changes of the future? If you want to compare with previous years just click on the links below to download reports from 2011, 2012 or 2013 – or just click on the image on the right for this year’s report. Please note, there was no report for the year 2014.
via Download now: State of Maternity Services Report 2015 | RCM. Can research into ‘the weekend effect’ be used to support the move towards a 7 day NHS? In the last 10 years an increasing number of research studies have examined the association between weekend hospital admissions and poorer patient outcomes including higher rates of mortality. There is significant evidence demonstrating this ‘weekend effect’. This document describes the main research, reports and reviews into this area. “It remains unclear how many deaths are avoidable. While further evidence on the causal relationships would be of value, we do not think that this can be a justification for taking no action where there are good clinical reasons for doing so. “What these figures actually mean is now hotly debated. The secretary of state for health seized on them before they were published to support his call for more senior consultants to work at weekends. This leap, from a statistical excess of deaths in patients admitted at weekends to a solution focused on more senior medical staff working at weekends, is just one way in which these data are being abused and the public misled. In September, influential medical journal The Lancet published a study which helps us take a fresh look at the way people in England are affected by ill health. We can now compare how different diseases (like cancer or heart disease) and risk factors (such as smoking or alcohol) have caused death and disability across England since 1990. This is the first time a study like this has been done in England and it helps health professionals like me test whether the effort being expended on a particular disease or risk factor in a particular area is proportionate. Indeed, anyone can do this by playing with the interactive tool produced alongside the study. Things have generally changed for the better: we are living longer. But the picture is complicated. Yes we’re living longer but we’re spending more years in ill-health, often living with a combination of conditions, some of which would have previously killed us. 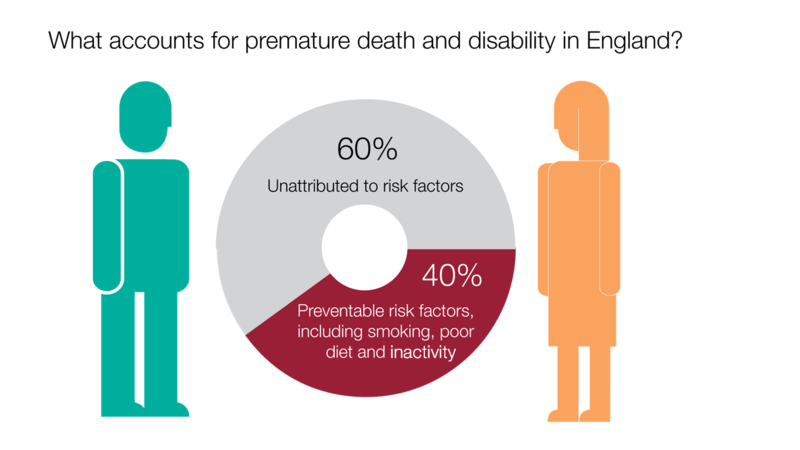 The study also shows us that 40% of ill health in England is due to potentially preventable risk factors, with unhealthy diet and tobacco being the two biggest risks. In other words, if we improve in these areas, the implications and opportunities are potentially huge. Read the full article via Prevention, Prevention, Prevention: What a Ground Breaking Study Means for Health in England | Professor Kevin Fenton.